The romance of luxury rail travel is coming into the limelight once again. Its charm is closely associated with the nostalgia of the bygone era of slow travel. In its winding way across the heart of the country, a train journey offers the marvelous glimpses of the countryside with unparalleled scenic views of the landscape. 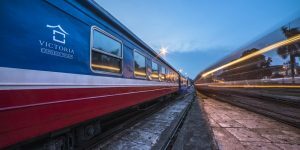 The discerning travelers acknowledging Luxury Travel coupled with Slow Travel are preferring a luxury train as a mode of transportation over the airplane, wherever possible. This emerging interest in luxury rail holidays is extending a pull towards slow travel while spawning a new generation of audaciously designed luxury cabins for the most sophisticated travelers. Read more about the recent trends of slow travel. 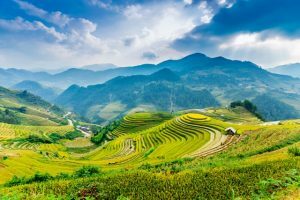 If you are planning to explore the fascinating beauty of North Vietnam from Hanoi to Sapa while getting mesmerized by the exoticism of its landscape, appeal of the indigenous culture and rural life of local people, a train to Sapa from Hanoi by Victoria Express is the best one to opt for. As the name suggests, this express train is a facsimile of ultimate luxury and grandeur on wheels. This stylish Victoria Express train to Sapa evokes a strong sense of elegance, heritage, and history. French constructed this railway track from Hanoi to Lao Cai and inaugurated in 1910. 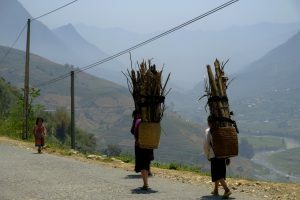 This Sapa tour Vietnam embeds a rich heritage. The train puts on its whistle at 10.00pm to set off for Lao Cai. It runs overnight for eight hours to reach Lao Cai at 6.10am. A perfect time to set off for your Sapa tour. 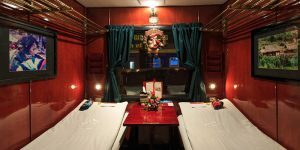 A restful overnight luxurious train journey is a delightful experience to treasure during Vietnam trip after a day’s exploration in the Old Quarter of Hanoi, witnessing the legendary Turtle Tower in the center of Hoan Kiem Lake, admiring the charms of the French colonial buildings in the alleys of Old Quarter and paying respect to Ho Chi Minh at his mausoleum. As the dawn sets in, you can sense the swift overnight transition from vibrant city life to calm and peaceful countryside. An incredible view of the mountainous landscape with green valleys and terraced rice fields peeps through in between. This picturesque setting of North Vietnam welcomes its guests at Lao Cai before an en route to Sapa shortly. The mesmerizing views are enough to boost you up for an exciting Sapa tour ahead. In luxury travel industry, luxurious rail holiday is a rising trend and is also an ecological and viable holiday option. The overnight journey by Victoria Express in North Vietnam allows the travelers to experience an ultimate royalty and grandiose. It is elegantly designed with luxury cabins, equipped with all modern amenities and services. Thanks to its upscale furnishings and elite decoration creating a royal aura. The travelers can enjoy the outdoor scenic beauty while being in the comforts and pleasure of a 5-star stay on wheels. This speedy train journey from Hanoi to Sapa saves time, allowing the travelers to relax and enjoy their leisure time while getting refreshed for the next day adventure and sightseeing ahead. With Luxury Travel Vietnam, this leisurely ride can be complemented with the ubiquity of today’s traveling ideas like discovering more and more beyond expectations or crossing the threshold of adventures which is diverse in mountainous terrains of Sapa and Fansipan. According to industry experts, it is quite easy to convince the travelers for a luxury rail tour or rail holiday but what is important is extending them the experiences and memories that they look for in the journey. In today’s travel industry, luxury is something beyond comfort, 5-star stays and so on. It is more about personal experiences that a traveler wants to enjoy and admire. During Vietnam travel, this short yet pleasurable rail journey to Sapa allows the travelers to get familiar with Vietnam Railway Services which is very much different from most of the countries around the world. The route to Sapa is highly mountainous, so bumpy rides are quite common in case of roadways. This problem is greatly minimized in rail route, especially in case of luxury trains like Victoria Express. Contrary to other express trains, luxury rail tours like Victoria Express offers elite-class facilities. The cabins are specifically designed to ensure complete privacy of the travelers. High-end restrooms and refreshment cabins offer a perfect luxury escape from the cabins whenever needed. Luxury Rail Tour is like a 5-star stay on wheels while cherishing the passing by beauties. Sapa is cuddling on the mountain lap around 35 km away from Lao Cai Station. It takes around one hour to reach Sapa city center from Lao Cai through picturesque meandering ways. Outside the Lao Cai Station, a number of buses and minibusses wait for the tourists for transfer to Sapa. Luxury Travel Vietnam arranges a private transfer for its guests at the Lao Cai Station. This comfortable luxury private transfer allows them to enjoy the early morning scenic beauty of glorious Fansipan and entire Sapa. On the way, you can stop at a few viewpoints including the famous Bac Ha Market to witness the bewitching backdrop after early sunrise. Sapa tour Vietnam is a very common itinerary mostly among trekkers and adventure passionates. As an alternative to train to Sapa, there are the options for buses and private cars. In case of Sapa bus, there are multiple options to choose from. However, for a 6-hours journey from Hanoi to Sapa, you cannot compromise with luxury. Travelers will come across a medley of private operators for Sapa bus. But only a handful offers air-cushioned luxury suspension reclining seats in good condition. For the bendy twisting routes of the steep mountainous terrain of Sapa, comfortable seats are very essential to avoid motion sickness. Toilet facility is there in most of the luxury Sapa buses. Generally, the service includes neck pillow, blankets, bottled water and light snacks. Sapa buses ply both in daytime and night. As the wheels move further north from Hanoi, nature starts reflecting its varying shades, somewhere sharp edges testing your dare, sudden mist, and clouds and then again gigantic shapes appearing suddenly from behind the clouds. Private car is another option but undoubtedly, it charges pretty higher than Sapa bus or train. Considering the long distance travel from Hanoi to Sapa, private car transfers are also not as comfortable as train or bus. Private cars drop you at the doorstep of the hotel whereas Sapa buses make its way till Sapa city center. 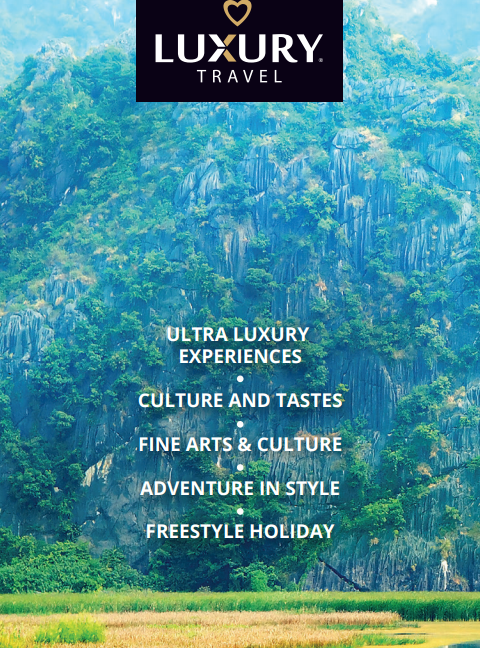 With the continuous twist and turns in the luxury travel industry, Luxury Travel Vietnam is redefining its way of approach to interpret the needs and demands of luxury travel connoisseurs on an individual basis to create tailor-made holidays according to their preferences. We take the pride of providing personal services with a professional approach. We emphasize on creating lifetime memories during your Southeast Asia holidays. Contact us here for rail tour to North Vietnam or a complete Vietnam holiday package along with Cambodia, Laos, Myanmar or Thailand.